Alex Rodriguez’s lawyer claimed victory yesterday for his star client, even after the Yankee admitted he’s been lying for months about using steroids. 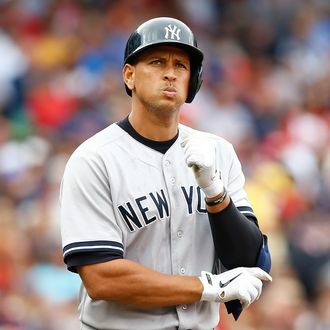 A-Rod had insisted that he didn’t use banned substances and even fought a Major League Baseball attempt to suspend him. But last February, he admitted to federal agents that he’d been paying a drug dealer posing as a doctor $12,000 a month to supply him with PEDs, according to a report in the Miami Herald. Rodriguez came clean to the feds in exchange for limited immunity — he can’t be prosecuted for what he said. For lawyer Joe Tacopina, who’d accompanied A-Rod to his interview, that constituted a win. “He didn’t get indicted,” said Tacopina, “he’s not like Barry Bonds and Roger Clemens,” both of whom stood trial for lying about their use of banned substances. With his client granted immunity, Tacopina said Rodriguez was in the clear. “It’s over. Game. Set. Match,” he said. Last year, A-Rod spent millions to buy stolen documents in an effort to fight Major League Baseball’s attempt to ban him. It didn’t work. The arbitrator in the case tossed him for a season, the longest suspension in baseball history. But, given recent admissions, A-Rod may have avoided a worse penalty. He was scheduled to testify under oath. Instead, he stormed out of the hearing. Had he lied at the proceedings, he could have faced perjury charges.